Anarchist Federation. Excerpted from a longer article "The union makes a strong?" With all due respect, I think this article is over-simplified and inaccurate in a couple of places. There's no doubt that the COM committed treachery against zapatismo; moreover, that an alliance between the two would have quite possibly toppled the ruling class. Various currents within the COM travelled out to Morelos to attempt to broker deals with the zapatistas and they failed for a number of reasons, some of which are mentioned in this article. Depicting the zapatistas as anti-state is unfair though: the original uprising was in favour of Madero and Zapata attended a number of conferences and treaty negotiations in order to re-negotiate the terms of peasant existence. Even the Plan de Ayala merely suggests a different President candidate and "free elections". In fact, it was only really his contact with the Magón brothers and their associates which made him question the role of the state at all. Zapata never really took the urban proletariat into account in his grand schemes for Mexico, and therefore the somewhat naive and short-sighted COM leadership was able to be manipulated by the carrot and stick methodology of Carranza et al into believing that they represented a threat to their organising. I studied this in a bit of detail a couple of years back...I may have lost the notes on an old laptop but when I've moved and am back from travelling, I'll dig them out. - In 1913, government troops had burned down la casa offices in Mexico City in response to a strike wave, and unleashed heavy repression. Many of the most militant workers, including anarcho-syndicalists fled south to join Zapata's forces, who would take the city within the year. - The decision to join forces with Obregon's reformist government precipitated a three way split in la casa between constitutionalists, zapatistas and villistas. Significant minorities in many la casa unions and majorities in some refused to fight with the government, again with many anarcho-syndicalists among them. In 1912 the anarcho-syndicalist Casa del Obrero Mundial (House of the World Worker) was formed and rapidly attracted the urban workers of Mexico City to its ranks. Yet, within three years the anarcho-syndicalists were organising Red Battalions to fight in defence of the Mexican state! Another point worth mentioning is that the 'urban proletariat as vanguard' position described in the article was not the anarcho-syndicalist one. The anarcho-syndicalist group la luz wanted a unionism that united peasants and workers; in the wider movement there was a debate between Marxist-influenced industrial unionism (with the IWW one example), which tended to be urban-centric and oriented to industrial democracy, and at the other end explicitly communist anarcho-syndicalism (eg FORA) which tended to be anti-industrial and support rural communes. If there was a single mainstream anarcho-syndicalist position, it was probably that peasants should form communes and workers should take over industry, as would later form the basis of the CNT's revolutionary program and Isaac Puente's 1934 pamphlet on libertarian communism. So the attitude described in the article, assuming accuracy, is much more likely to have emanated from Marxist-influenced leftist unions in la casa than anarcho-syndicalists. Now of course none of this means the Mexican anarcho-syndicalists were without fault; there was opposition to Zapata and this was based largely on anti-Church sentiment (the Catholic church was a powerful institution for reaction and the Zapatistas were on the whole highly religious), as well as Zapata's lack of any significant urban program. This did result in splits amongst the anarcho-syndicalists and some of them 'pragmatically' went with the constitutionalists thinking they were the best bet for building a powerful revolutionary union movement (obviously such class collaboration is nearly always fatal - they were well played in a divide and rule). But sloppy history and false assertions presented as fact are no way to go about identifying and acting on such failings. okay, thanks for that clarifying information, it was very helpful. I think the main point of contention really then is did any anarcho-syndicalists help form red battalions to fight the Zapatistas? and if so, how many, and what proportion of the total? Any books or documents which go into this in more detail? Yeah i know the AF article it's from. It's pretty poor - conflating trade unionism, Tom Mann-style syndicalism and anarcho-syndicalism as it suits the predetermined conclusion. Doesn't speak well of the anarchist milieu a decade or so ago really (i'm sure you can find contemporary SolFed pieces 'proving' the sins of anarchist communism with a similar lack of rigour). ** incidentally, it was neutral unionism that was favoured by many prominent anarcho-communists (like malatesta) at the time, although that doesn't discredit anarcho-communism today since 100 years of development has interceded. Casa was never officially anarcho-syndicalist, as Joseph correctly notes here, tho anarchists may have been the most numerous radicals or socialists in the Casas (they existed in several cities). They adopted the red & black flag but there wasn't a very deep layer of familiarity with libertarian unionist ideas among militants, I think. When an important faction of officials (such as Luis Morones) made deals with the Constitutionalist generals, there was a split. This was the beginning of the officialist unionism that became dominant in Mexico. The anarcho-syndicalists then formed CGT. CGT took out of Casas a sizeable chunk of members, with about 50,000 members by early '20s. They had major organizations in Mexico City & Vera Cruz. I believe CGT was formed in 1920. Especially strong among street car & textile factory workers in Mexico City. I've uploaded a newer article from the AF on the Casa, which, I'm afraid to say will annoy Joseph Kay,and maintains the central assertions of the original article. as John M. Hart notes:"In February 1915 a Casa delegation travelled to Veracruz, met with Carranza and Obregon Salido representatives, and committed organized labour to the constitutionalist military effort. The Casa leadership had no illusions about the ‘bourgeois alliances’ of President Venustiano Carranza, but reasoned that the constitutionalist movement, which had received Veracruz from the American government and masses of armaments through that port and Tampico as well as Pacific ports, was a likely winner. The Casa leaders reasoned that their participation ushered in a new era of syndicate organizing and working-class power. They provided the constitutionalists with the personnel needed to man the newly acquired American weapons. The anarchosyndicalists intended to organize the working class and then to confront the divided constitutionalist movement, with its mutually antagonistic Obregonista radical pequena burguesia and the conservative Carrancistas. In that confrontation the Casa leaders counted on ‘Jacobin’ support including that of Obregon Salido. In the late Spring of 1915, the Casa directorate created a Comite de Propaganda numbering about 80 members divided into fourteen subcommittees to organize workers in the wake of the constitutionalist armies. After the defeat of the Division del Norte the constitutionalist unity of upper-class elements, pequena burguesia and industrial workers’ groups unravelled. Casa anarchosyndicalism, workers’ militias and strikes, provoked the concern of industrialists and constitutionalist officials. Urban food shortages, runaway inflation, unemployment, public demonstrations by angry workers, script monies for factory payrolls, wildcat strikes and armed workers calling themselves ‘red’ created a volatile situation. The constitutionalist elites and Obregonista ‘Jacobins’ had armed the urban workers in order to defeat the agrarians. Now they faced the spectre of a working-class revolution. Yet, they could not crush the Casa at this early point in the revolutionary process without seriously damaging a unity needed while the Villistas and Zapatistas remained a force to be reckoned with." To say that the COM did not define itself as anarchist is disingenuous. Jacinto Huitron, the administrator of COM even during his later class collaboration, defined himself as an anarchist as did Luis Mendez its treasurers. 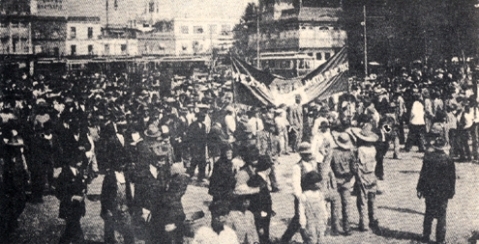 Huitron led a Red Battalion of 5-7,000 in support of Carranza against Zapata while Mendezbecame COM delegate to the parliament of the Conention ( To his credit Mendez like Jahn, Diaz Soto y Gama did later rally to Zapata-see above) Writing to anarchist in London in 1915 Huitron and Mendez avowed that the COM was "clearly anarchist", excused the Carranza movement by saying that it "has much to do with politics since the people have been...cruelly exploted by all the privileged of the world who come to exploit the poor Mexican proletariat". Whist Zapata was a true revolutionary, he was one who confessed his ignorance of "of all that about socialism and anarchism". They excused the role of the COM with CArranza because of the lack of consciousness of the masses, and the minor role of COM in the Revolution (see John Lear, Workers, Neighbors, and Citizens: The Revolution in Mexico City) It seems clear that the leadership of the COM was predominantly anarchist, so the mistakes it made cannot be reduced to the lack of consciousness among its members. And apparently much of that "anarchist" leadership very quickly ceased to be anarchist. As with Luis Morones, who used his relationship to the generals to gain government support for CROM. Nothing here about how the CGT came about or how the split in the labor movement developed. In other words, Battlescarred, it still seems a hatchet job designed to attack anarcho-syndicalism. So, if you put anarchist in inverted commas you can explain away everything. I see. "Anarchist-communist" Kropotkin takes pro-war position.